Say hello to your new favorite recipe for chicken salad. It combines perfectly tender chicken, crunch from veggies and nuts, a little sweetness, and the easiest creamy dressing. The salad tastes terrific the moment you make it but gets even better over time. Perfect for meal-prepping! 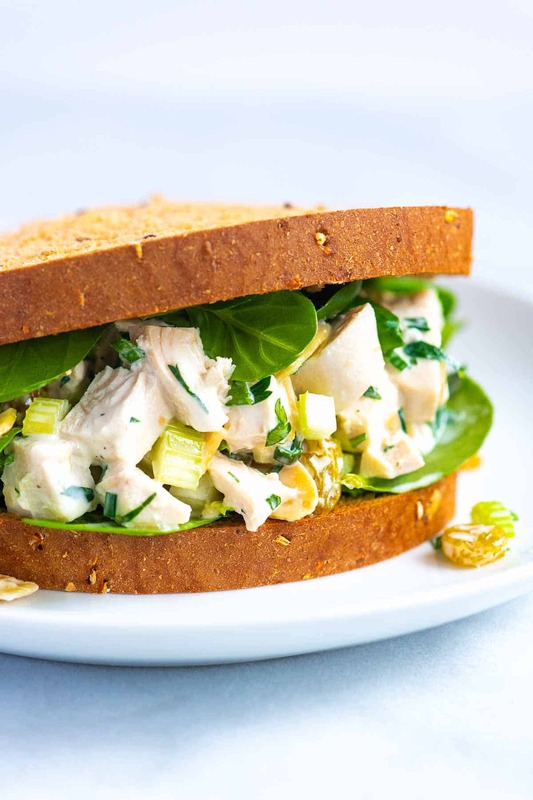 Jump to the Easy Chicken Salad Recipe or read on to see our tips for making it. The perfect chicken salad has a few critical components: tender chicken, crunch, a little sweetness, and it needs to be easy to make. This recipe has all of that, and it’s even easy to adapt to what you love. Let’s go through the ingredients you need for the chicken salad. I’ll share our basic version as well as a few adaptations you can make to make it even more special. 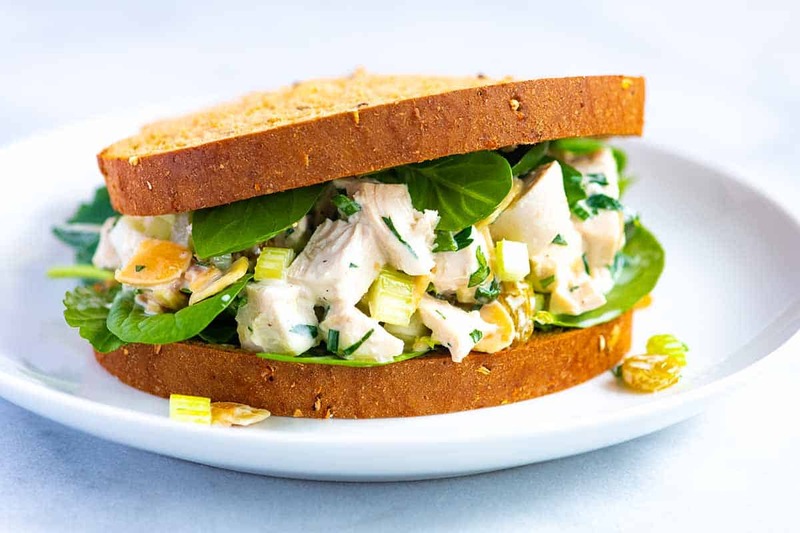 Chopped or shredded chicken — If you’re up for it, use our quick poached chicken recipe for flavorful, soft, and tender chicken that’s perfect for this chicken salad. This shredded chicken or leftover roasted chicken would also be an excellent base. Veggies for crunch — Just like when we make egg salad, we don’t like to add too many ingredients to the salad, so we only add celery. 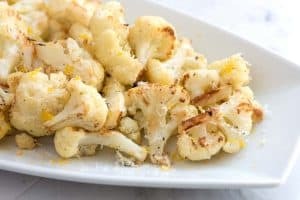 For more vegetables, try carrot, fennel, bell pepper, shallot or onion (although, be careful that they are not too strong). Nuts or seeds — Texture is a big deal when it comes to chicken salad, that’s why we add lots of it with celery and nuts or seeds. In the photos, we’ve added sliced almonds, but most nuts and seeds will work. Think about pistachios, walnuts, pine nuts, pecans, pepitas (pumpkin seeds), and sunflower seeds. Something sweet — Here’s where you can have lots of fun! We love dried fruit in our chicken salad and especially enjoy golden raisins. Dried cranberries, apricots, dates, or other dried fruits also work. You can also add fresh fruit like halved grapes or chopped apples. Simple dressing — Our chicken salad dressing is mayonnaise based. All you need to do is stir a couple of tablespoons of fresh lemon juice into mayonnaise and season with salt, and you are ready to toss. To make the dressing even more special, you can add a couple of small dashes of toasted sesame oil. A little goes a long way, but it adds a pleasant umami flavor to the dressing. 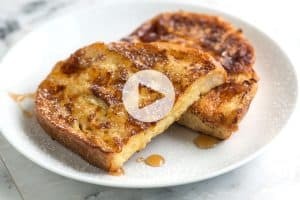 For something a bit sweet, you can stir in a teaspoon or so of your favorite jam. By the way, for a healthier chicken salad, try swapping some or all of the mayonnaise called for in the recipe with plain or Greek yogurt. The dressing will be a bit tangy, but will still taste great. When stored properly, the chicken salad keeps in the refrigerator up 3 to 4 days, which is great news because as I mentioned above, the salad tastes great the moment you make it, but give it a day in the fridge, and it tastes even better. We keep the salad tightly covered in a glass container. Our classic egg salad recipe only calls for six ingredients and tastes incredible. For a twist on the classic, try our easy avocado egg salad. This quinoa salad is seriously good with vegetables, chickpeas, and a flavorful dressing. We put this chopped tomato, onion, and cucumber salad on top of everything. It’s a staple in our fridge. The perfect chicken salad has a few critical components: tender chicken, crunch, a little sweetness, and it needs to be easy to make. This recipe checks all the boxes. We have shared our basic recipe as well as a few suggestions for making it extra special. We highly recommend the toasted sesame oil — it adds a lovely umami flavor to the dressing. A little goes a long way, so only add a few dashes (not more than a 1/4 teaspoon). When we have the time, we poach chicken breasts for this salad. Here’s our detailed recipe for how we poach chicken. 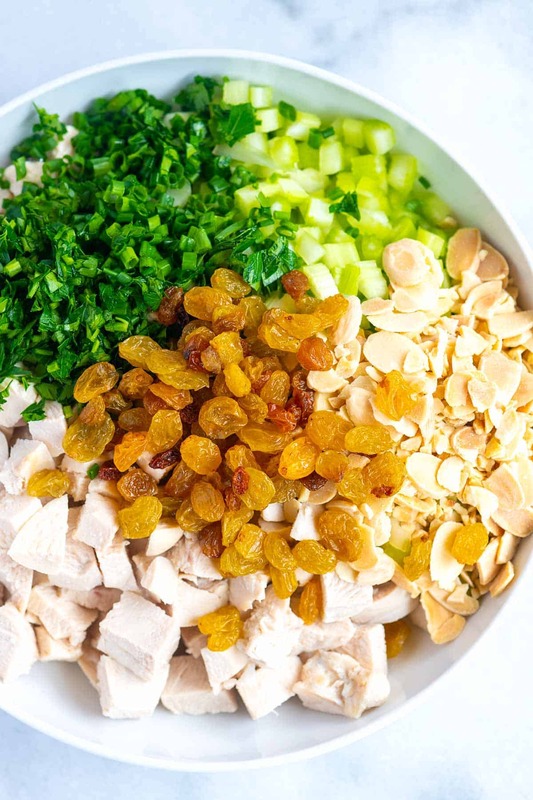 Combine the chicken, celery, herbs, nuts, dried fruit, and fresh fruit (if using) in a medium mixing bowl. In another small bowl, stir the mayonnaise, lemon juice, mustard, salt, and the black pepper together. Taste then add the optional ingredients. Toasted sesame oil adds umami (a little goes a long way), and the jam sweetens the dressing up a bit. Toss the dressing with the salad. Taste then adjust with more salt and pepper. Store, covered tightly, in the refrigerator 3 to 4 days. In addition to or as a substitute for the dried fruit, add a handful of fresh fruit like halved grapes or chopped apples. For a lighter chicken salad, swap the mayonnaise for light mayo or use plain or Greek yogurt. This is a very nice recipe. Unfortunately, I used half the amount of chicken and then forgot to halve the dressing (I’m famous for doing that). But still, I used their Perfect Poached Chicken recipe they suggested, and it’s soooo delicious and easy. 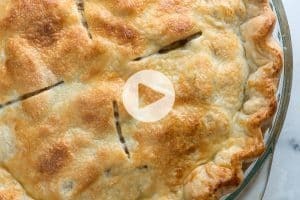 Will be my ‘go to’ for Chicken Pot Pie and whenever I need cooked chicken for a recipe. Thank you for sharing your culinary skills and recipes, which I find are right up my alley!